The gap between black and white unemployment is roughly the same now as it was in 1963, southern schools are resegregating and the wealth gap is widening. Median black household income remains stubbornly half that of white households. 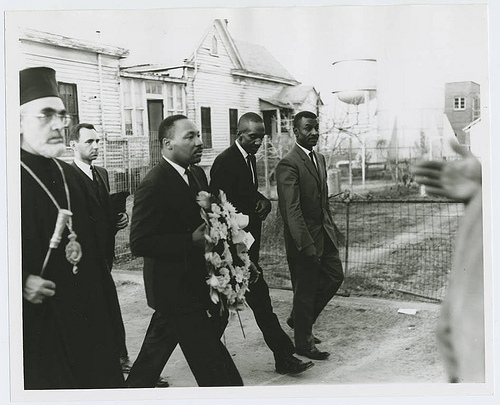 MLK’s last 31 hours: the story of his final prophetic speech. The Guardian: Martin Luther King remembered across US. Vox: How America has — and hasn’t — changed since Martin Luther King Jr.’s death, in 11 charts. Exactly 50 years after the murder of Martin Luther King Jr., America is still far from his dream. Across measures ranging from criminal justice issues to economic well-being, black Americans still lag far behind white Americans. In some cases, there has been progress since the civil rights era and King’s death. But the situation has actually gotten worse for many black people. There are myriad reasons for this. Outright racism. Policies that don’t adequately address past and current systemic obstacles for black people, particularly segregation. Policies that make such problems worse — like restrictive covenants, redlining, blockbusting, and steering. And a total lack of attention to key issues, such as the criminal justice system’s neglect of huge racial disparities in just about everything it does, from policing to incarceration. 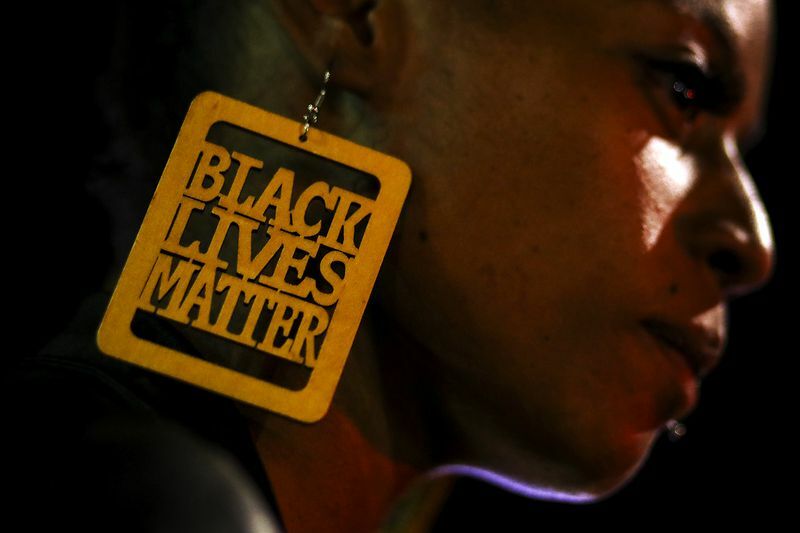 A Black Lives Matter demonstration against the Sacramento Police Department after two officers shot and killed Stephon Clark in the city on March 23, 2018. Whatever the cause, the result is seen in the numbers below: From earnings to getting a college education to incarceration, black Americans generally do worse than their white peers. For all the hope that King professed, America is still a land of racial inequality. 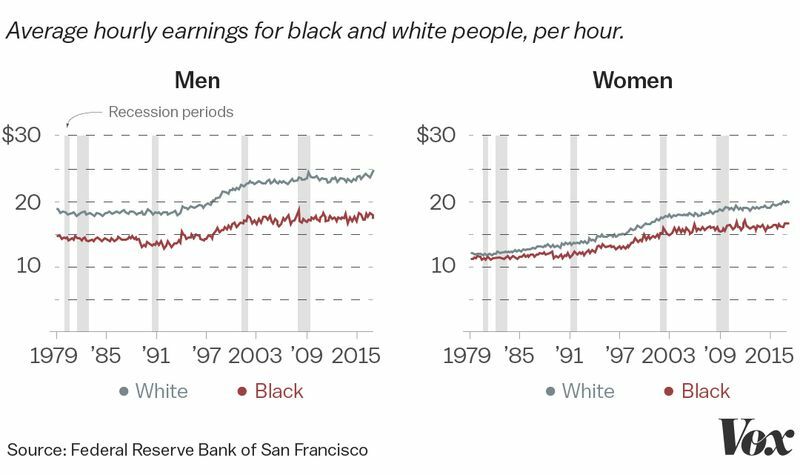 It’s not just that black people generally make less money than their white counterparts; it’s that the wage gap between black and white workers has widened steadily since the late 1970s. A recent study on race and economic mobility found that black men in particular see much less mobility than their white counterparts, even after controlling for hours worked, employment rates, family structure, and a host of other variables. That could help explain how black workers remain so far behind. How bad is the job market? The numbers suggest that can depend on your race. 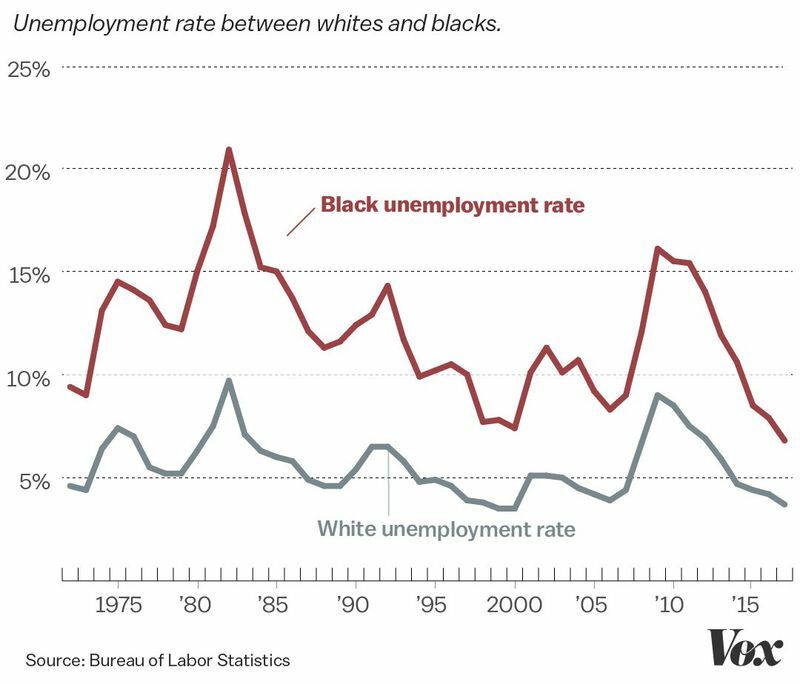 Historically, unemployment rates have been around twice as bad for black people as their white counterparts. Racism likely plays a big role in that: Studies have found that when all else is held equal in job applications but the name of the applicant is changed to be stereotypically black as opposed to stereotypically white, the stereotypical white names “were 50 percent more likely to elicit positive responses from employers” — and some research suggests these kinds of disparities have gone unchanged since at least the late ’80s. 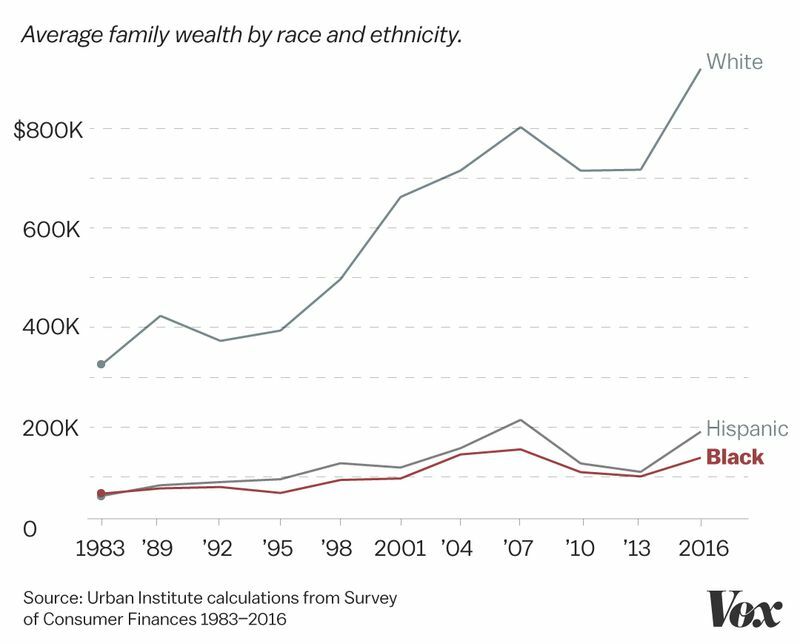 Given the numbers above, this statistic should be unsurprising: White families hold muchmore wealth than their black peers. As the Urban Institute noted, this is largely a result of the earnings gap — people accumulate less wealth over their lives if they’re making less money on a yearly basis. The good news is that black poverty rates have declined over the past few years. The bad news is there are still massive racial disparities in who remains poor. But, largely due to the persistence of residential segregation, black kids are still much more likely to grow up in a neighborhood with medium or high levels of poverty than their white peers. And in fact, black (and white) kids are actually more likely to live in a high- or medium-poverty neighborhood than they were during the civil rights era — a sign that even as poverty has generally declined, geographic concentrations of poverty have gone up. One of the great victories of the civil rights era was the Supreme Court ruling in Brown v. Board of Education that deemed racial segregation in public schools unconstitutional. 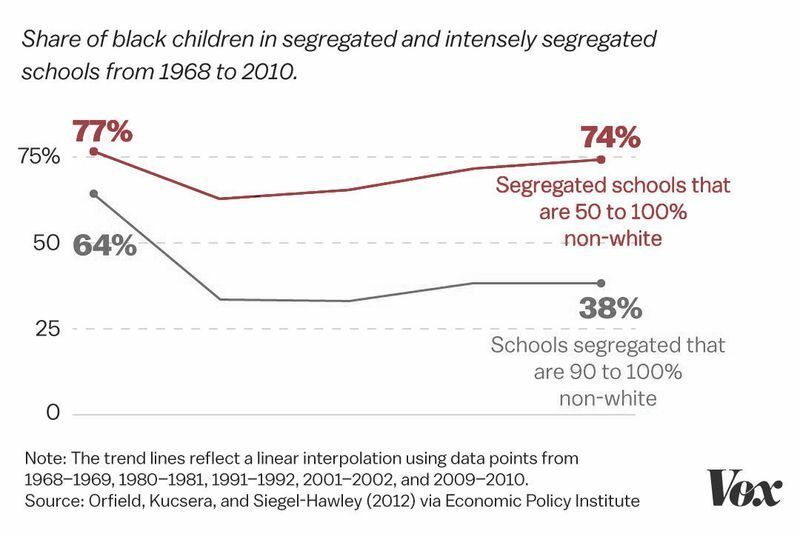 Yet, as Alvin Chang wrote for Vox, racial segregation in schools has remained stubbornly high — in large part because residential segregation has kept black kids stranded in neighborhoods with mostly black schools and white kids in neighborhoods with mostly white schools. And while local policy reforms could alleviate the problem, white parents in particular are often resistant to ideas that can spur more integration — fearing that it will make their schools worse. Here’s some good news: The gap between black and white completion rates of high school has nearly closed since the 1960s. 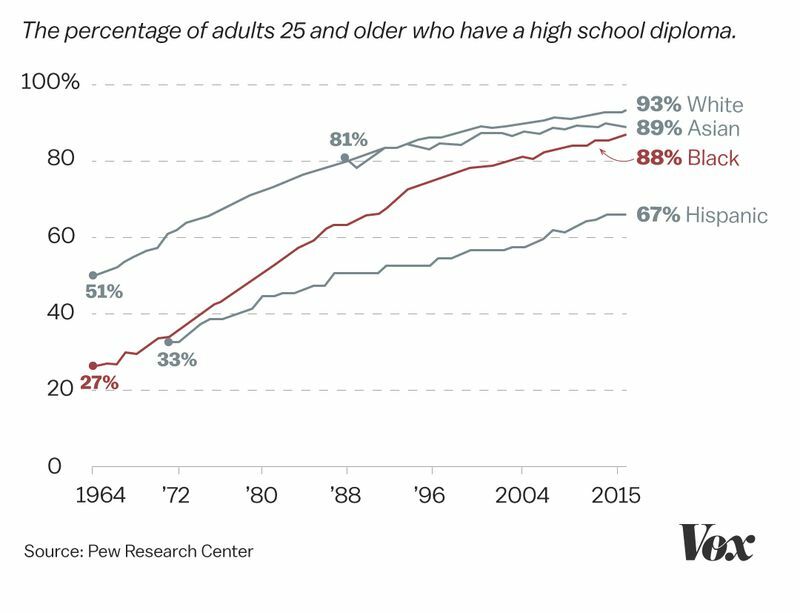 White Americans are still a little more likely to graduate, but the gap is nowhere as big as it was in the past. 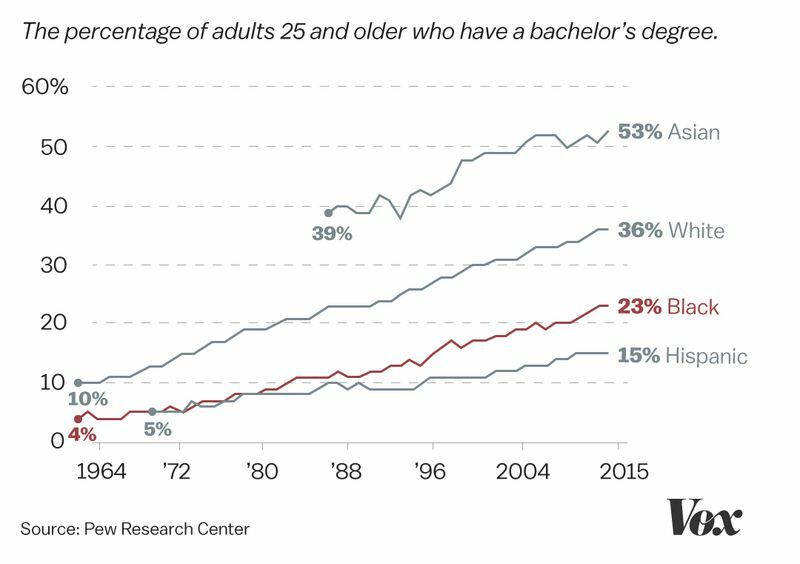 While black and white college graduation rates have increased over the years, white people are still more than 50 percent more likely to obtain a college degree. The Voting Rights Act of 1965 was a tremendous victory for the civil rights movement, notably increasing voter registration and turnout in the South in the years following its passage. 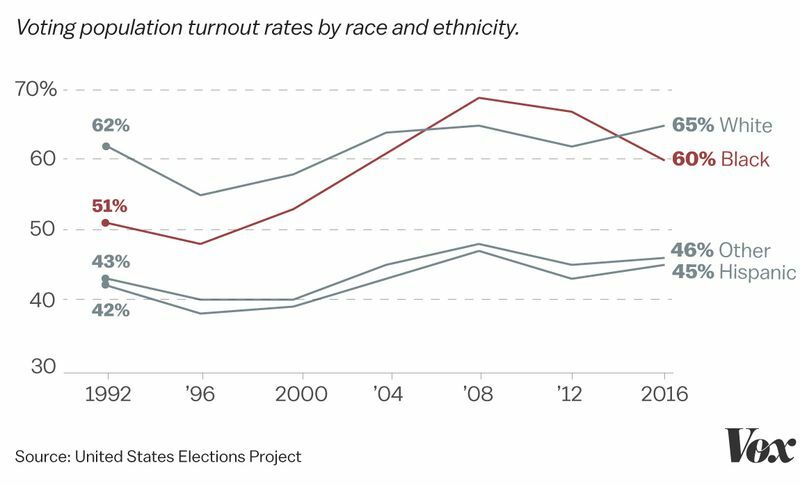 In the decades since, black voter turnout has fluctuated from presidential election to presidential election, but it’s generally trended up — and when President Barack Obama was on the ballot, black voter turnout even surpassed white voter turnout. That doesn’t mean everything is perfect; a 2013 Supreme Court decision weakened the Voting Rights Act, and in the years since, states have more aggressively tried to restrict access to the voting booth in ways that could disproportionately hurt black voters, from strict voter ID laws to cuts in early voting. Responding to waves of crime in the 1960s through the early 1990s, lawmakers around the country passed laws that increased prison sentences and pushed for more incarceration to combat crime. Studies suggest this had only a small effect on crime rates. 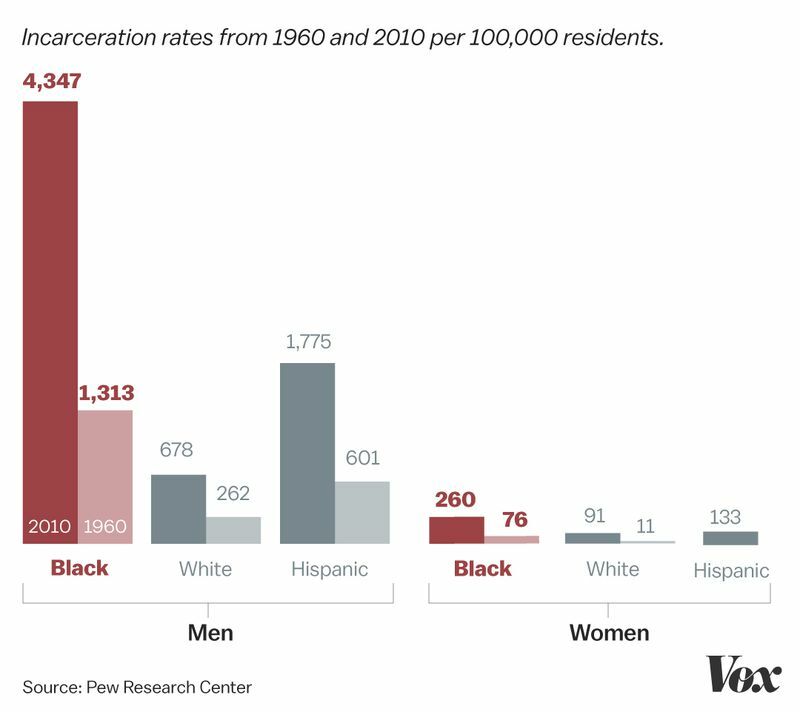 But it had an enormous effect on black people — who are disproportionately likely to be locked up. A 2015 review of the research by the Sentencing Project concluded that only 61 to 80 percent of the disparity could be explained by higher crime rates in black communities — meaning as much as 39 percent is attributable to other factors, including, potentially, racial bias or past criminal records influencing a prison sentence. The result was documented in a 2015 New York Times analysis, which found that there are, in effect, “1.5 million missing black men” in America who could be fathers or workers in their communities but instead are behind bars. 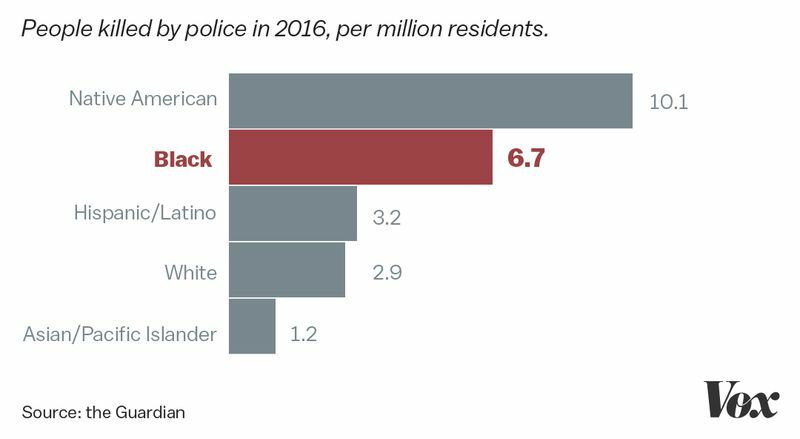 There’s no good historical data on this, but we do know that, as it stands today, black people are much more likely to be shot and killed by the police than white people. Studies have suggested that socioeconomic factors and crime rates don’t fully explain the gap — and that racial bias may be a factor, based on research that shows that police officers are quicker to shoot black suspects in video game simulations. Not going to lie here, a good well-rounded article complete with stats to back up the facts! Police brutality is still pretty controversial but kudos to you for taking a professional look at it!! good job!! I’ve only recently started blogging so Its nice to see brilliant posts such as this one!